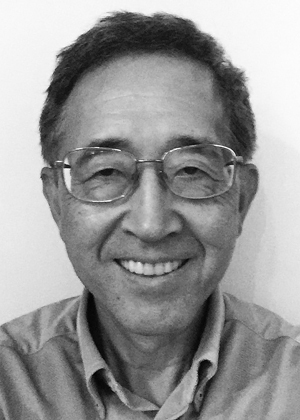 Shun-ichiro Karato was awarded the 2016 Inge Lehmann Medal at the American Geophysical Union Fall Meeting Honors Ceremony, held on 14 December 2016 in San Francisco, Calif. The medal is for "outstanding contributions to the understanding of the structure, composition, and dynamics of the Earth's mantle and core." Prof. Shun-ichiro Karato is a thoroughly deserving recipient of the American Geophysical Union’s 2016 Inge Lehmann Medal for his seminal research in mineral and rock physics and its implications for our understanding of the structure and dynamical processes of the Earth’s mantle and core. Shun has built a formidable reputation as one of the foremost mineral/rock physicists of his generation by always choosing interesting and rewarding research problems and tackling them with a mix of creative experiments and original analysis and interpretation. It is a characteristic of his work that experimental results are always placed in a wider context. This involves the use of appropriate models for material behavior, often drawn from the field of materials science, and a typically bold and provocative discussion of the application of the new insights to the behavior of the Earth. He has made multiple important contributions to our understanding of the deformation of Earth materials by developing and applying new experimental approaches for the study of the rheology of the high-pressure minerals of the transition zone and lower mantle, culminating in an opposed-anvil “rotational Drickamer” apparatus capable of high-strain deformation in torsion at pressures reaching those of the uppermost lower mantle. This technique has recently allowed the first large-strain deformation experiments on the wadsleyite and ringwoodite phases of the transition zone and the bridgmanite + ferropericlase mixture of the lower mantle, within their high-pressure stability fields, providing new insights into dislocation slip systems and rheology. Shun has had a sustained interest in the influence of grain size, water, and partial melting upon rheology ever since his pioneering work in the 1980s delineating the boundary between the dislocation and diffusional creep regimes in fine-grained olivine aggregates. The capacity of phase transformations occurring under conditions far from thermodynamic equilibrium to drastically reduce grain size and thus influence the rheology of the cool interiors of subducting slabs has also been emphasized. He first suggested that partial melting of the mantle might strengthen it by removing water from minerals into the melt. He has also actively explored the link between deformation and the development of fabric with important implications for seismic anisotropy in the upper mantle and in the inner core, where he has suggested a role for the magnetic field. Shun has been an influential thinker about seismic wave attenuation and dispersion. In recent years, he has led studies of the effect of water in nominally anhydrous minerals on their electrical conductivity, rheology, and deformation fabrics. The breadth and depth of Prof. Karato’s contribution to our understanding of the mechanical behavior of geological materials are well illustrated by his powerful synthesis Deformation of Earth Materials, published by Cambridge University Press. Thank you Eiji and Ian for your kind nomination of me for the Lehmann Medal. Thank you also to those who supported this nomination and the committee members. It is my great pleasure to receive this honor for what I have done during the last ~40 years of my life. I was born in Fukuoka, Japan, 4 years after the end of the Second World War and became a student of the University of Tokyo in 1968. That was a special year. In 1968, the model of plate tectonics was established, and the student rebellion spread throughout the world and there was no lecture at the University of Tokyo for more than a year. But this was the year in which I learned the most. I became an independent student and finished my Ph.D. without a supervisor. When I was struggling to become a scientist, luckily enough I had a chance to spend a few years at Australian National University (ANU) in Canberra. The time in Canberra was just so wonderful both scientifically and personally. In a very relaxed atmosphere, people there conducted world-class scientific studies. For the first time in my life, I got rigorous training as an experimentalist. I also learned that there are different styles of conducting scientific studies. Developing “bold” hypotheses and testing them with rigorous approaches is one way of doing science that I learned at ANU. When I was a student, I got fascinated by geodynamics but soon realized that understanding materials properties is a key to putting a strong physical basis on geodynamics. Among various physical properties connected to geodynamics, I chose rheological properties and the role of water on various properties as the topics of my studies. These are the problems in “mineral physics,” but I have been trying to go beyond conventional mineral physics. I focused on issues that are closely connected to geophysical observations. In studying these problems new approaches are sometimes needed, including technical developments. Developing a new technique is essential but challenging in the busy recent scientific community. I was fortunate to enjoy much support from colleagues including students and postdocs that made this challenge sometimes successful. In particular, I should mention colleagues in Tokyo, Canberra, Minnesota, and New Haven. And, last but not least, I thank my family (my wife Yoko and each of our parents). Without their selfless support I would not be here today. Thank you all. —Shun-ichiro Karato, Yale University, New Haven, Conn.
Citation: AGU (2016), Shun-ichiro Karato receives 2016 Inge Lehmann Medal, Eos, 97, https://doi.org/10.1029/2016EO064097. Published on 28 December 2016.